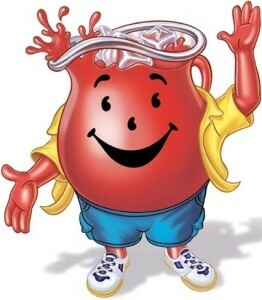 Let me explain… we drink a lot of KoolAid in our house. Like ‘a gallon a day‘ type of ‘a lot.’ It sounds like a lot. (It’s really not.) 128ozs. 16 cups. But there are four people in my house, and even though we make a gallon of KoolAid every day, we don’t exactly follow instructions. Instead of the presweetened stuff, we use the packets, and mix two flavors – one regular and one lemonade, which we like on the tart side. They say to use one cup of sugar per packet; we use one cup of sugar for the entire gallon. We use half the sugar called for. Moving on to why I’m writing this in the first place… I often comment that we don’t drink a lot of pop in our house – just a lot of KoolAid. I often (almost always from parents who let their kids drink 3-4 cans of pop a day) get the incredulous, but that’s no better than pop! line. Today I crunched some numbers. Oh no! Not the maths! I hate the maths! But now I have the numbers to back me up. I’ll start with the basics. We already know there are 128oz in one gallon, and pop is 12oz/can. A quick Google search informed me that 1c of sugar is 200g. Now for the math part. For comparison, I looked at a can of Caffeine Free Pepsi I drank (some of) yesterday. 41 grams of sugar in 12 ounces of liquid. Let’s put that in perspective: That’s 2.18 times as much sugar in the pop as the KoolAid. PS: In a 20oz bottle of Glacial Freeze Gatorade, there are 34g of sugar, which is 20.4g/12oz of liquid. PPS: Don’t even get me started on the cost difference – I haven’t crunched those numbers. But darn it all, if I’m not off to do that right now! GRRR! A 12-pack of Pepsi currently costs $4.88 at Walmart. That’s $.40 per 12oz can. There’s more math involved in calculating the cost per on the KoolAid, but here it is anyway. A 10lb bag of sugar measures out to 4535.924 grams. If you recall, there are 200 grams in a cup, so I divided that 4535.924 by 200 and got 22.6 cups. 5.44 divided by 22 = (rounded up to) $0.25 + $0.58 (the cost of 2 packs of KoolAid) = $0.83/gallon. Now I get to divide that by my original 10 (# of whole 12oz portions in a gallon) and got $0.08/12oz “can” of KoolAid. That’s $0.0066 per ounce of KoolAid, VS $0.033 per ounce of Pepsi. One gallon of Pepsi at that cost is $4.26, a whopping 5.13 times more than a gallon of KoolAid costs.